Carlisle Academy is honored to be named a United States Pony Club Riding Center within the Northeast Region. Pony Club is one of the leading equestrian organizations in the world and offers the motivated rider access to internationally-recognized mounted and unmounted horsemanship curricula following PC standards of proficiencies. Carlisle has two levels of involvement: The Formal Pony Club Program and Curriculum Clubs. These programs are offered year-round within an 6-week Winter,12-week Spring, 6-week Summer and 12-week Fall calendar, with lessons focused on Tuesday – Saturday. Please see current annual calendar. The Formal Pony Club Program is the foundation of the Pony Club experience and is offered year-round. It is designed for independent equestrians, ages 8 to 18 (Juniors), who commit to 10 monthly Saturday meetings throughout the year for three hours (time of day is dependent upon certification level) and maintain national and regional memberships*. Through the Pony Club certification system, along with sanctioned horse shows and rallies, members receive quality instruction and access to various disciplines of their choice such as dressage, eventing, and hunter seat equitation. In addition to providing a solid foundation of equine skills, the Pony Club experience emphasizes personal growth and the development of citizenship and life skills. Members may also choose to be involved in service-learning apprenticeships as sidewalkers and equine assistants, helping Hippotherapy and Adaptive Equestrian Sport students. All programs take place at the Academy and are led by Carlisle’s nationally certified teaching staff. Members may truck in their own horses or utilize Carlisle program horses. Those who pursue certifications on program horses may do so through D3 Eventing and Hunter Seat tracks, and through C3 in Dressage. Independent Study: For Junior members who are not able to participate in the majority of the monthly meetings, or Senior Members (18 and older) who want to pursue the certification levels on their own, Carlisle will design an independent study program taking into account time dedicated to mounted and unmounted instruction and adherence to the standards of proficiency. Group participation in rallies and sanctioned events is still encouraged. This curriculum club is designed for the young equestrian, ages 5-8, as an introduction to horse care and mounted skills, as well as receiving foundational education through the Pony Club Curriculum. At this stage, age-appropriate games/skills, safety and fun are at the center of all activity. Members attend the 10 monthly Saturday mounted meetings from 9-10am, and are assisted by the upper level PC members and a Carlisle instructor. Additionally, members may take weekly lessons through discounted lesson packages, as time allows. U.S. Pony Club national and regional memberships are not required. This curriculum club is designed for adults who want to learn the USPC curriculum alongside an organized group of like-minded individuals. This adult-friendly format provides first-rate equestrian education and follows the traditional Pony Club certifications. Members commit to 5 monthly Friday evening lectures (unmounted) throughout the year, focused on stable management and unmounted instruction. 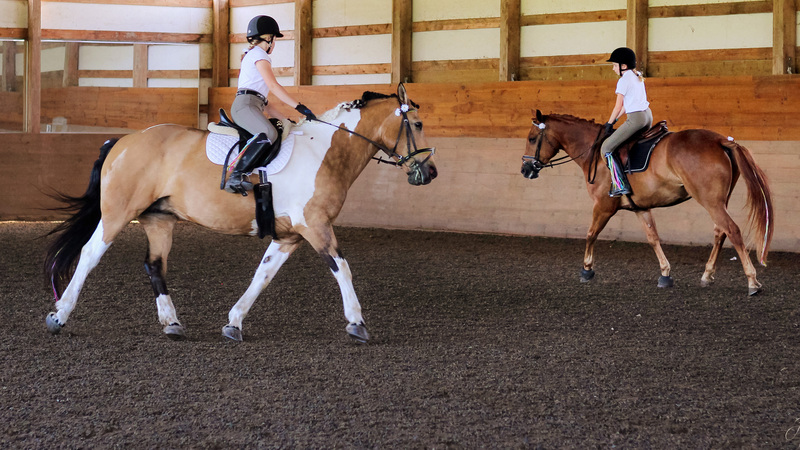 Additionally, members are encouraged to take weekly lessons through discounted lesson packages, either in Hunter Seat or Dressage lessons, or enjoy group lessons in Quadrille while practicing for a performance. U.S. Pony Club national and regional memberships are not required. For registered Pony Club Members, Little Boots or Silver Spurs only. These are discounted rates, and must be used within the session purchased. Riders can opt for Dressage, Hunt Seat, Quadrille or stadium jumping lessons in privates or groups, and will be matched according to riding leveling. Carlisle instructors teach weekly lessons to the greater community in recreational dressage and hunter seat equitation following the pony club standards. These lessons are offered at the full rate for individuals who do not wish to join one of the clubs.